The tour starts in the pretty village of Krimml, high in the Hohe Tauern National Park, close to Europe’s highest waterfall which plunges 1,250 feet in three remarkable cascades. 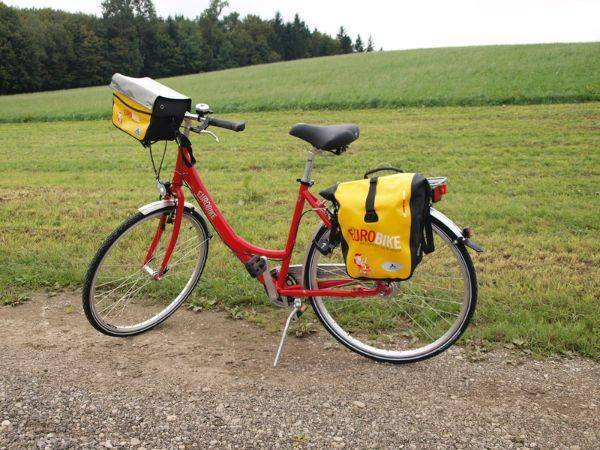 The cycling route follows the Salzach Valley on dedicated paths through pine forests, picturesque villages and flower-strewn meadows. As you approach Kaprun, the snow-capped peaks of Austria’s highest mountain range come into view, at 12,400 feet the Grossglockner is an awesome sight. 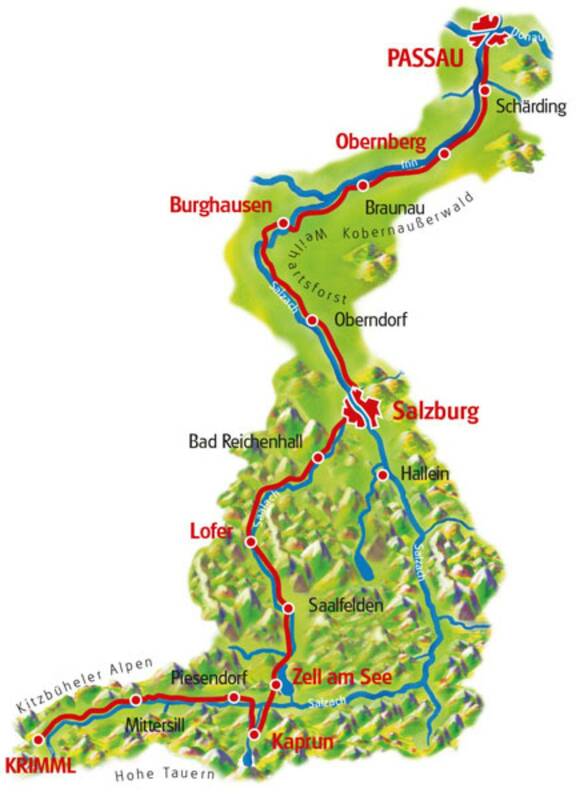 The route continues along the lakeside through stylish Zell am See, then onwards to Lofer and Salzburg. The tour ends in the river city of Passau. The bike paths on this tour are well detailed and signposted. The route leads through quiet villages on paved paths and country roads. A few very brief sections you will ride on unpaved paths. This cycling tour is also suitable for families. You can use this day for a refreshing bath in the Lake Zeller See. The more sportive cyclers can do an extra round along the lake. Alternatively, you can make a day-trip with public busses on the “Großglockner” which is the highest mountain of Austria. A stroll along the esplanade will remind you on a more south destination and certainly you will forget your daily hassles! You will cycle through “Maria Alm” with its famous pilgrimage church. The lunch break you can enjoy in Saalfelden. Other highlights on your way to Lofer are the Seisenbergklamm and Lamprechtshöhle near Weißbach. You will soon reach „Stift Reichersberg“ which is worth a visit. 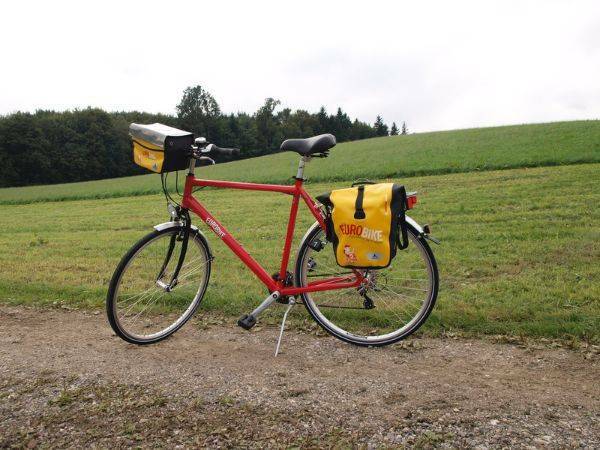 On your route along the river Inn you will cycle through small towns like Schärding. At its Baroque market square you can take a break. Not far and you will have reached the final destination of this beautiful bike trip: Passau. The three-river city has much to offer. In the cathedral of Passau you will see the largest church organ in the world. A river-cruise would certainly be a grand finale of this wonderful bike ride. In Passau there's a lot to discover. We would be appreciated to book an extension of your trip. Entire tour goes along the Tauern Cycle Path which is well-signposted throughout, from Salzburg however you follow the local cycle paths. You cycle on quiet, asphalted or gravel cycle paths or rural roads, only occasionally is there moderate traffic where it is unfortunately unavoidable. There are only very few accents to tackle. 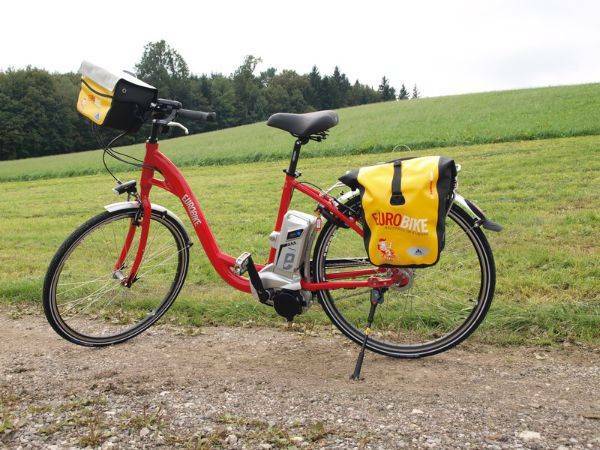 The Into the Valley of the Alps (Tauern Cycle Path) cycling holiday includes the daily transfer of luggage to the next hotel and local support if required.